HomeNow you can link your AA American Advantage account to your US Airways Dividend Miles account. 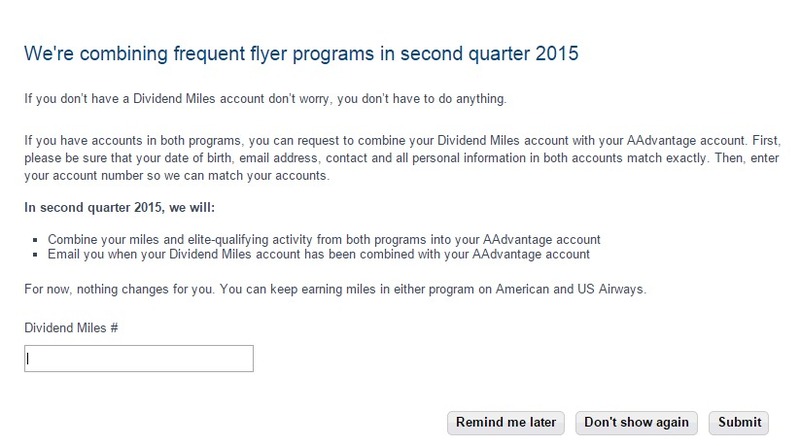 Now you can link your AA American Advantage account to your US Airways Dividend Miles account. Another step toward combining the loyalty frequent flyer situation at the new American Airlines. You can now link your US and AA accounts. The miles won’t combine yet but should in the 2nd quarter 2015. It might not hurt to go ahead and do this. If you had trouble and they didn’t match log into each account and check that all your names, phone number and date of birth, etc. all match. My wife’s account failed because she had only her middle initial on US Air but had her whole middle name on American. Once I fixed it it went through fine. What does all this mean right now? Not much yet but I still think it’s too your advantage (pardon the pun) to go ahead and link them. I think this may hold more true for elites in either program but that is just guessing on my part. As they go through the IT process of combining the programs it will eventually combine your miles and accounts together at some point in the 2nd quarter. Speculation is that it will happen early 2nd quarter but we will see.